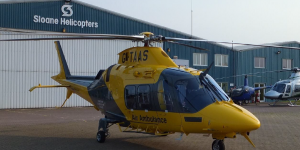 Sloane Helicopters is very pleased to announce the addition of the GrandNew to its EMS fleet. The delivery took place in Italy last week with the aircraft returning to Sywell on Friday evening. The EMS GrandNew is equipped with a number of advanced features that increase safety and reduce pilot workload. These features include a Synthetic Vision System, a four-axis autopilot, HITS (Highway In The Sky) technology and a Helicopter Terrain Awareness Warning System. These features are a number of the latest developments from AgustaWestland that make the GrandNew the most technologically advanced helicopter in its class. In addition, the aircraft incorporates a number of modifications to complement the NVIS compatible cockpit. Sloane Helicopters is the UK and Ireland distributor of AgustaWestland and Robinson helicopter products.